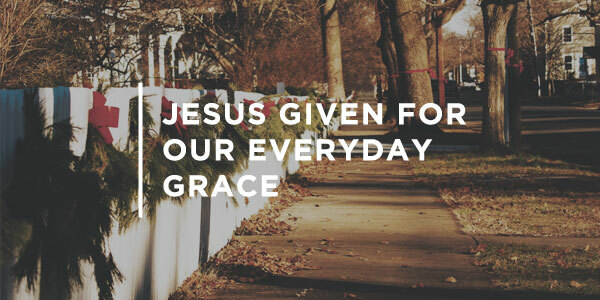 The following is adapted from Bob Hoekstra’s daily devotional Day By Day By Grace. As the ultimate free gift of God’s grace, Jesus was given for us (dying for our sins): “He who did not spare His own Son, but delivered Him up for us all” (Romans 8:32). Moreover, He was given for us to be given to us (that He might express His life in and through us). We began as enemies of God. Certainly, we were lost and condemned. Yet, our situation was even worse than that. Our lives worked against the purposes and plans of God: “And you, who once were alienated and enemies in your mind by wicked works” (Colossians 1:21). Our evil thoughts and activities set us against the Lord in both mind and deed. The only way that we could become the friends of God was for Jesus to be given as a sacrifice for us. The Lord had to deal with our dual problem of sin and unrighteousness. The Father graciously placed our sins on His Son that we might have His righteousness. This precious gift of reconciliation, the turning of enemies into friends, was for all who would believe in Christ. What remained after Jesus was given for us (for our reconciliation) was that He would be given to us. Jesus came to dwell within us so that we could be “saved by His life.” Why do the friends of Jesus still need to be saved? Well, His followers would be persistently threatened by the world, the flesh, and the devil. They would still be vulnerable to temptation, doubt, fear, fruitlessness, distraction, inadequacy, and more. How then would they be saved from such threats? This ongoing rescuing work of the Lord would be “by His life”-by Jesus living in and through His people. “It is no longer I who live, but Christ lives in me” (Galatians 2:20). Jesus was not, and is not, susceptible to any of these threatening issues. When He is allowed to express His life in and through us, each of us finds all that we need all of the time. This astounding statement is true, because “Christ is all and in all” (Colossians 3:11). Dear Father, my reconciler, I thank You for giving Your Son for me, that I might be changed from Your enemy to Your friend by His death. Yet, much more, I praise You for giving Your Son to me, that I might be saved from spiritual futility day by day by His life. Lord Jesus, live in and through me, I humbly pray, Amen.